Delta Air Lines is reaping the benefits from major investments in the business travel experience, according to new data crunched by Bloomberg. The improvements are centered around lavish new perks in premium cabins such as improved catering and bedding as well as global cabin upgrades including business class suites. It also doesn’t hurt that Delta’s major hubs are less affected by low-cost carrier competition than those of American and United. All told, Delta’s global product improvements appear to be earning it plenty of loyalty among lucrative business travelers, an important segment for any revenue-hungry airline. And perhaps most interestingly, the momentum comes despite recent cutbacks in the airline’s official SkyMiles loyalty program. Quality of product, in this case, appears to be affecting loyalty as much as the broad loyalty program itself. American and United should take note. Much like the makers of designer handbags and craft beers, Delta Air Lines Inc. is finding it pays to pursue the high end. Flying has gotten cheaper across the board in recent years, but Delta is beating its major U.S. rivals at retaining a premium on tickets sold to bigger-spending business travelers. 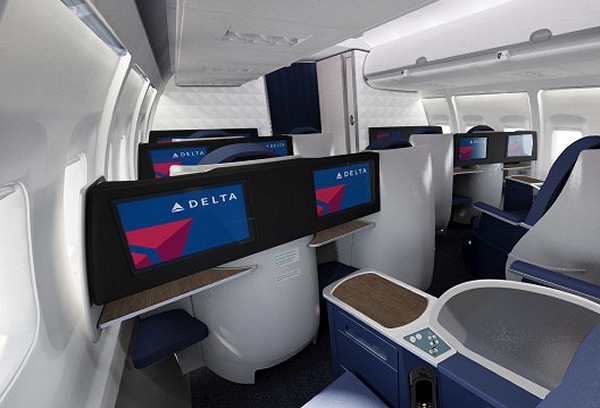 The highest 10 percent of one-way Delta fares started at $521 last year, down 12 percent from 2014, according to ICF Inc., which crunched the numbers for Bloomberg. United Continental Holdings Inc.’s fares in that category fell 16 percent, while comparable ticket prices at American Airlines Group Inc. dropped 21 percent. “Since Delta controls more business revenue than American or United, that gives them fewer seats that face really low-cost competition and their fares are diluted less than American or United,” said Ben Baldanza, former chief executive of Spirit Airlines Inc. Given the payoff, all the carriers are chasing the prosperous by lavishing perks on them. Delta equipped its new Airbus SE A350 international planes with private suites in the business-class cabin, each with a sliding door. United is rolling out its Polaris-brand international business cabins with lie-flat seats and direct access to the aisle, while American added sit-down dining in its lounges for people holding first-class international and transcontinental tickets. Fares have been falling due to increased capacity along with the growth of discount carriers; lower fuel prices, which have started to rise again, also played a role. U.S. airlines threw their restraint “out the window” in 2015 and tripled their previous U.S. growth rate by adding seats at about a 5 percent clip, said Austin Horowitz, an aviation consultant for ICF. Not surprisingly, Delta has been trouncing rivals financially. Its operating profit margin was half again as much as at United and American last year. One reason: Delta has less direct competition from deep discounters like Spirit. Delta also controls 70 percent or more of the market at hubs in Atlanta, Detroit, Minneapolis and Salt Lake City, according to Morgan Stanley research. So, it “owns” the lucrative business travel at its hubs more than its rivals do, said Baldanza.